dude for real this is pretty amazing. I think every muppet fan needs to see this and have one !! WOW Lance... just plain WOW! That is absolutely amazing! You need press coverage for this... it's amazing! Lance, this is SO AWESOME! Thank you for this, can't wait to see more!! I sent you an email just now while waiting for the entire page to load. It is incredible, amazing and perfect!!! Your attention to detail is unreal. If you put a gun to my head I couldn't do a fraction of what you created. YOU ARE THE MAN THIS IS AMAZING!!!!!! Wow, just followed this link from someone's post on Facebook and was blown away. I'm one of the few people on the earth to actually have the entire Muppet collection and this just makes me drool. Execellent work. Just wonderful and amazing how much detail there is in this. Plus the fact that it can fit the other playsets makes it just perfect. Wonderful job. By the way, I'm the guy who created the second image that you used in the post. Glad to see it being used. Another Muppet fan here. Thanks so much for posting these pictures and commentary. Your work is stunning. I'm sad my Palisades Muppet collection is just standing lamely on the shelf. Can't wait to see your future projects. Thanks again for sharing! can not wait to see Statler and Waldorf's box. Oh my gosh, this is breathtaking! Bravo, amazing work. What amazing craftsmanship and design. I bow down to you dear sir! Really truly amazing work. Just to help you out, Scooter's outfit is from when he was a popcorn/concessions vendor in the 3D Movie Theater in Muppets Take Manhattan. Again, though, this is awe-inspiring. Everytime I look at it, I go, awwwww. That was truly a thing of beauty. Amazing! Wow, that's amazing! Can't wait to see more! Palisades did release their backstage, though. I have it, but it's nowhere near as cool as your stage! I found this because my friend posted it to his facebook feed. You did a really amazing job. Really admirable craftsmanship. Skill, sir. Very extremely skill. I am...simply an utterly...blown away. In my mind's eye, this is almost exactly what I would have imagined the next playset could have looked like in my head, though admittedly I think there were some discussions about TRYING to squeeze the balcony in there if possible. You did a fantastic job here, really first rate. Would it have been something that we could have produced? Probably not. Some things would have to be shifted around in order to actually work from a production standpoint, but there is as much love in that handmade set as there was in any of the things we did at Palisades, and that's what it was all about. Seriously...one of the most beautiful, most inspiring things I have ever seen anybody do with that line of figures and how to display them. Amazing work. I came across this from another forum, and am blown away. You should be very proud. This is the best thing I have ever seen!!! This is so amazing that it's making me teary-eyed. Thank you for sharing it. This is seriously some fantastic work! Everything looks so well made...I'm really glad a friend forwarded me this post. Thanks so much for all the positive comments you guys, it really means a lot!! I plan on making many more Muppet Theatre add on pieces so keep an eye on my blog. Its always good to know that working with creative passion can pay off. I hope you are all dong the same! I don't get sentimental about our old company very often these days, but to see this level of creativity and passion that was spurred by our product line is pretty amazing. Congrats on the work and thanks for sharing. Lance, I am jealous. That is absolutely amazing work. If I lived in the Vancouver area, I would steal this and blame it on Ken Lilly. Thanks so much for posting the pics of your work, I'm looking forward to seeing more as you complete other pieces! Well, there's nothing like a good theater playset, and this is nothing like a good theater playset. Whoa ho ho!!! This is totally amazing. The craftsmanship is outstanding. The thought put into the tiny details was ingenious! Can't wait to see what the others come out like. Abso-freakin'-lutely GENIUS! Clearly a labor of love. I'm impressed beyond words. The amount of craftsmanship here is unbelievable! This more than a labor of love, this a work of art. Kudos! Bravo. This puts the stage playset I made out of cardboard and fabric to shame. Very well done. A Muppet Masterpiece. I found you through FARK and it's early moments before you get flooded - but as someone who's working on an equally odd ( but will not be as well executed) project let me just tell you how awesome you are!!! Palisades wouldnt't have been able to mass produce the level of wonderful detail you've created - it's brilliant design but I'm sure you exceeded what they would have done and made the original toy designer who came up with the backstage playset really really proud . Oh my.... Simply STUNNING!!! Picture perfect in every aspect! Looking forward to the continuation!! That is just amazing. The detail just blows me away. What a wonderful tribute to the Jim Henson and the Muppet Show! The only problem I see with it is now everyone is going to want one! Great job, seriously (am very jealous) You totally nailed it. I've seen some good homemade backdrops in the past. I've seen a few gread backdrops in the past. NONE come close to this. This is beyond superb! It's absolutely amazing and I can only imagine how many hours of blood, sweat, and tears it took to get it as perfect as it is. Sir, you are an artist. You could bring reality to us Henson fans. I would pay through the nose to be able to complete my sets. Thank You for upholding my childhood dreams and memories. Incredible! Your peg rope system is often referred to as a pin rail. This is the most amazing thing I have ever seen. FANTABULOUS!!!!! You are the man every muppet fan wants to be best friends with. awesome stuff. Well done Sir. The JIm Henson company put your link on facebook today 3/28/2011. I think its awesome and wish you the best of luck in your career. This belongs in a museum. Thank you for sharing your excellent photos. Truly amazing! Soooo much love put into this project. This is making the rounds to all Henson employees (past & present). You should be VERY proud of your work and we congratulate you! You put the Art in theater Art./ A masterpiece you should be proud! I'm trying to find the words... easily a ten thousand dollar custom playset. This is the neatest toy theater ever. I was blown away! The painstaking detail - WOW!! You have some serious talent - Kudos to you! Just one question - start to finish: How many hours in this labor of love? Thanks for taking me back to remember my favorite muppet (Animal) & favorite sketch: Pigs.....In....S-P-A-C-E! It's time to play the music, it's time to light the lights! Howdy! Just wanted to say how your work thrilled me. I love The Muppet Show and I also love miniatures. When I was younger I build a castle for Britains Ltd knights...fun to research! This work is amazing and to be treasured! Tears from your art and the wonderful memories it brought back of my grandpa and I eating popcorn and watching The Muppets. (After Lawrence Welk, of course *grin*)Thank you. Well done. You have been given a gift! Your craft is beyond outstanding. It made me remember all that was good about being a kid again. Bravo! This is one of the most beautiful things I have ever seen. Being both an action figure customizer and someone who works in the theater, my mind is boggled about the work and time and care that went into this project. Can Canadians be knighted? If so, I'm calling the Queen tonight. One of the coolest things I've ever seen. Amazing work. Would LOVE to have one. This is such an amazing achievement! I admire your love and dedication. The attention to detail is just magnificent. Makes me really want to watch some muppets. Hats off to you. I was pretty dissapointed as well that Palisades never got around to release the Backstage playset. You truly have created something unique. This is just amazing! This is a fantastic piece of work Lance. It's beautiful, and you should be proud of yourself. OMG! I can't even imagine the creativity, dedication, talent and sheer awesomeness this took to create. Have a child that is a serious muppett fan and will have to share the link and listen to the pleading but so worth the viewing! Good Luck on your future endeavors and hope I get to see some of them! Incredible labor of love. I am so impressed, thank you for building this! INCREDIBLE. floored by your attention to detail!!! I grew up watching my father spend insane amounts of time building detailed train layouts, and later, beautiful Clipper ships and Frigets. Detailed cannons and rigging. But this is almost beyond imagination. I loved the Muppets of course. They actually seem alive in your wonderful stage ! Stunning execution ! This is fantastic! Thanks so much for sharing. Well done! Hats off to you, sir. It's time to get things started, indeed. Holy Hell! This is truly fantastic! Oh, how it makes me wax nostalgic! You're pride cup should be overflowing! This is incredible, and I am utterly speechless. Thank you for this! AMAZING!!!!!! YOU ARE ONE TALENTED INDIVIDUAL. SO TALENTED THAT YOU DESERVE ALL CAPITAL LETTERS!!!!! Amazing presentation! I Loved it! Truly amazing & inspirational. Looking at your other work as well, and... wow. Great talent. Simply amazing. Have wanted to tackle something similar for years, but would have never produced something this detailed and beautiful. Wonder if it would be possible to do a few rows of the audience as well... this came out so wonderfully it makes anything seem possible. Very humbled and inspired by your talent and vision. Well done! I always believed the Muppet theatre was real. Now I have faith again. Thank you! This was just a wonder to behold. You are awesome. Dude, you did an absolutely amazing job. The best part is how the other playsets fit within the stage - you did SUPERB planning to get everything to fit together so well! I can't wait to read more posts! OMG, i got an email via mental floss featuring your playset. This is absolutely amazing and I really enjoyed looking at every picture!!! The details were awesome! I hope you do share this with Palisades- hopefully someone somewhere can hire you doing all that you love!! I am looking forward to your future sets! Thank you for posting these photos. What amazing work! As a true fan of the muppets I salute you! I also got here via the e-mail from mental_floss. I wish I could come up with something more substantive than "WOW!" but, well... WOW! This is simply incredible, and such an obvious labor of love. Absolutely amazing work! Simply amazing. Well done, sir. Jaw dropping amazing!!!!!! What a gifted artist you are. Thank you 'Mental Floss' for telling us all about this one. What an amazing recreation! You totally NAILED it. Can't wait to see the new photos you put together. This TOTALLY made my week! Thanks, Lance! Thank you for this. You've made my, and several of my friends day. Plus - Alberta represent! Back in my oilpatch days our rig actually did a bunch of work up in the Wabasca area. I didn't get to meet many of the locals, but the folks working in the camps and running the water and vac trucks were awesome and very friendly! Checked out some of your other projects too. You are very talented and I'm in awe!!! This is absolutely amazing. Your talent (and persistence) is incredible. Thank you for sharing this with us. I've never met you. Please marry me. You are so incredibly gifted! Absolutely amazing and I hope you get to work for the Muppets or Disney some day! Wow, I just crept in through the back door, and so enjoyed seeing what you have created! thank you for sharing. 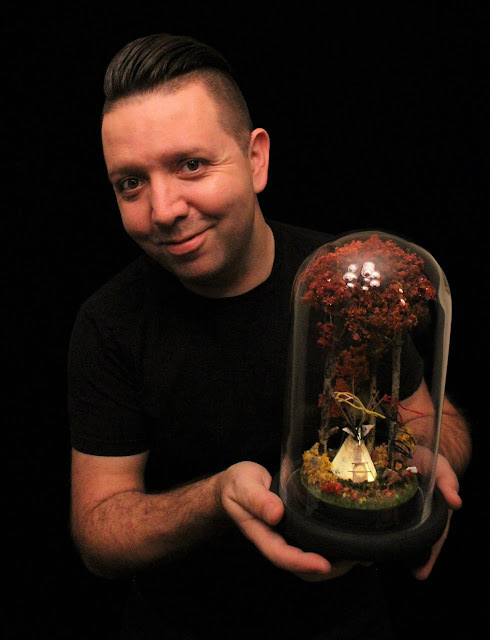 I love miniatures and can understand what an incredible job you have done. HUGE kudos to you! Wow, that's absolute amazing. Pretty good job!!!!! 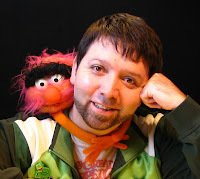 i have made a blogger account just so I could comment on and the complete awesomeness of the muppet theatre! I am absolutely jealous that I don't have this theatre in my posession so i could re-enact favorite muppet episodes. Great job!!!! How did I not know there were Muppet action figures?? Great work -- this absolutely rocks! As a (sometime) theatre musician, I can't wait to see what you do with the orchestra pit! This is Great. Absolutley amazing, you are very talented and should be very proud. I as well have a huge muppet collection. I have all the playsets except the muppets "Backstage playset" I have never found it at a price I could afford at the time. I have a huge lighted curio cabinet that I have all my muppets displayed in. You have done truly amazing work on the Theater. Well done my friend, well done. I don't even know what to say! I can't believe how awesome that is!! Well done mate. Lots of sleepless nights by the look of things! that clunk you heard was my jaw hitting the floor from the shere awesomeness! My sister and I were just singing the "Muppet Show " theme song and saying how we missed it. I got your site link fro an email I got from "The Water Cooler". Just wanted to say thank for bringing back such wonderful memories and I would love to continue to watch the completion of the set. WOW!!!!!! this is just AMAZING!! This is just beautiful. Great job! Wow, wow, WOW!! This is truly amazing. You should feel so proud that you built this. I want one! Jaw on floor. That was. Phenomenal. Manommanom. I didn't think it was possible for someone to love the muppets more than I do, but you totally win. Well played. Amazing. Makes me miss my Muppetized youth even more. Thanks for the awesome. This is toy theater done to perfection. Excellent craftsmanship - kudos on such a good job! All the wonderful detailing... it's so Muppety geeky beautiful! Seriously love it! I officially dub you most vikingly awesome!! Brilliant, beautiful, and amazing! Jim Henson is smiling down on you. Be so very, very proud. Gobsmaking. Brilliant. Stunning. Christ, I could go on and on. You are a rockstar. Best miniature Muppet Theatre I have ever seen, even though it is the only miniature Muppet Theatre I have ever seen! Great work on this, seriously awesome stuff! just totally brought back so many memories. I want to live in that world but I suspect I will have to get in line. Totally amazing! Thank you for sharing this beautiful work of art to the world! Walt Disney would have been envious. You've done an incredible job. This is incredibly detailed work! I hope this gets your talent noticed by the Henson Company. Do you want a career in building models for special effects houses? I hope to see your version of Miss Piggy's makeup and wardrobe room! Simply brilliant. I did not even know about these Muppet figures, much less a custom designed playset. Well done. You have done an awesome thing. I lost track of how many times I said "OMG I LOVE THAT!!" while reading and looking at pictures. Amazing work, and I'm so glad you shared it! AMAZING! This is beautiful. Thanks for sharing! Absolutely stunning work. Thank you for sharing this with us all! You just brought back every great childhood memory of mine. I loved the Muppet Show. THANK YOU for sharing...not just your out of this world (a la Pigs in Space!) work, but for the warm fuzzies that came with it. Freaking mind-blowing. A friend linked me after I mentioned offhand my obsession with the Muppets, and wow, I'm glad she did. Your work has done Jim Henson and The Muppets justice and I know he's smiling on what you've created and shared with others. Keep it up - you are a genius who has magic in his fingers! I can't believe how amazing this is! You must have worked so damn hard on it! It's absolutely beautiful! 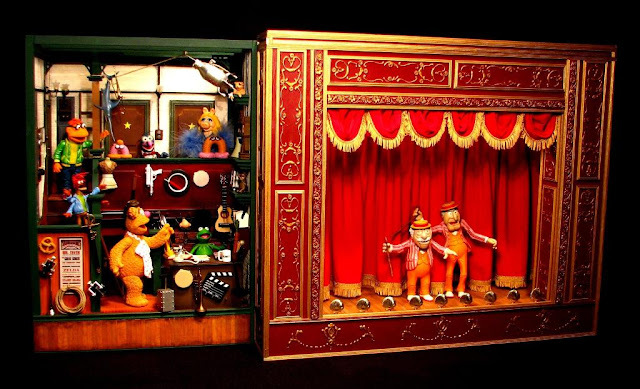 The entire Muppet Theatre Playset is astonishing.You've truly captured the Muppet Show. I admire the work you've put into this piece! Thank you for sharing it here. absolutely incredible! your attention to detail - oh wow. speechless. thank you for sharing your work with us. This is utterly amazing. I am in awe of yoru craftmanship. Stunning work. This is ridiculously amazing. I love it! This is absolutely amazing!!!!!!!!! I love every detail in it. Congratulations for all of your work, the result is awesome! Fantastic!! Your rendition is dead on! Thanks for the memory burst. This is just remarkable! I LOVE it! Jim Henson is smiling down at you right now. You got it exactly right! This is just remarkable. You got everything exactly right. Jim Henson is smiling down on you, bro! This is amazing Lance! This reminds me of the Ben Franklin quote “We do not stop playing because we grow old, we grow old because we stop playing!” I love it! Lance...this is FREAKING UNBELIEVABLE!I just kept saying "oh my goodness" every time I scrolled down. This work deserves to be at the Chicago Art Institute with the Thorne Miniature Room Collection. Congratulations on such an amazing "production"! Congratulations! Your attention to detail is wonderful, and I predict that you will go far in your new career. There are no words!! Fantastic!! - referred from Boing Boing. There's nothing I can say add that hasn't already been expressed. A real joy to get to see your work here and on your other pieces. You make it look so easy. Please add any additional making-of descriptions that you can offer to help in understanding miniature set and prop creation. Wish I had known about Crayola Model Magic, seems a lot easier to work with. I bought a box of Super Sculpey that will probably last me a lifetime, especially since it isn't the easiest to work with. This actually made me cry. As a kid, I was an avid Muppet fan. The Muppets are the reason I first wanted to work in television, and to do comedy, and to write stories. Although we didn't have much money, all of my birthday and Christmas gifts were Muppet merchandise, and any pocket money that came my way went straight toward a purchase for my Muppet cache! I wound up selling the whole collection when I was trying to come up with college tuition. Your creation is gorgeous, and perfect and for me...magical. Thank you for sharing it. I've bookmarked the page. It's my new happy place! I didn't even know about these Muppet toys until today, but you are my hero. Stunning... just beautiful! The level of detail is fantastic - it's absolutely perfect! Clearly a genuine labour of love and it would surely be the pride of any Muppet Show fan's collection. WANT! This is gorgeous!! Have you thought about looking into architectural models as a career?? Wow!!! Well done! just wanted to add my accolades; fantastic!!! I rarely comment on blogs but couldn't let this go by without stopping to comment. I am utterly floored by your talent and craftsmanship. What impeccable attention to detail! Clearly a lot of love went into this project. Congratulations!! This has made my night. Congratulations on an amazing job. You truly deserve all the accolades and praise for your dedication and work. I don't know if I could call myself a Muppets "fan", but it has a very dear place in my heart. When I was a very young girl, I'd wake my parents up at night to demand either "Mary Poppins" or "Muppets". They'd roll out of bed, pop the tape in the VCR and go back to sleep and I'd go to sleep watching it. I also have a thing for miniatures, good photography, and theatre/show business. So what you've created here is something that grabbed me in my 'awe' place while simultaneously tweaking my 'nostalgia' button. I mean it genuinely when I say I'm quite verklempt. I am flabbergasted and totally blown away. Your attention to detail is amazing. Bravo!!!! Congratulations! What an accomplishment. You really brought back fond memories of my childhood with this post. You are crazy-talented, thanks for sharing your work!!! Completely flabbergasted. The amount of detail you have put into this makes it perfect. You've outclassed Palisades. Beautiful work. Thank you for adding this wonder to our little Universe. Your work is an inspiration, and a wonderful tribute to such an important institution: The Muppet Show. Thank you for sharing these pics with the world. Wow, wow, wow. Thank you so much for this! OUT OF THIS WORLD! Amazing work, and so much fun to look at. Thanks for sharing. that is gorgeous. love it. got here from Boing Boing, btw. This is the most amazing thing I have ever seen. You have such a great talent and eye for detail! Wow. Wow. Wow. I don't know what else to say. Your devotion to making this look exactly like YOU wanted it to and your talent combined to give birth to a magnificent homage to the Muppets. But even if it wasn't Muppets-based, it is a magnificent piece of work. I'm speechless. THis is amazing, looks incredible, and the details are so good. I kinda get a cozy feeling watching it. I found this through craftzine's blog. The muppet stage is truly amazing! you have such fine details. I've also really enjoyed the evil Dead cabin and am looking forward to seeing new projects! Thank you for a delightful step back in time to my favorite childhood show! I am BLOWN AWAY...I have chills going down my arms...I am going to have to blog about this now that I found you...! I am absolutely, positively stunned. It's so beautiful it's almost hard to believe. I have nearly every single Palisades Muppets Figure and Playset, missing only the Wedding Kermit and Piggy and perhaps two other limited edition pieces. This is what the series should have had! 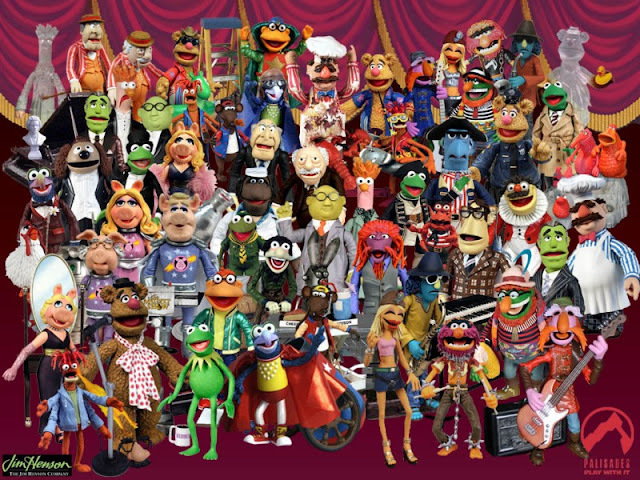 Check out March's post for a homebrew Muppets Role Playing Game! From one obessed fan to another, lol. WOW! Holy moly this is cool! I LOVE the Muppet show, so this is so awesome! I wish I could have got some of the play sets, but I'll settle for you amazing pictures! Thanks for sharing! so painstakingly and creatively perfect! most sensational inspirational celebrational Muppetational tribute and whalloping amazing fan art of Henson's masterpiece. A masterpiece in its own right, sir. BRAVO! And thanks for sharing. This is incredible. The level of detail is mind-boggling to the level that it's easier for my brain to accept that you've invented some sort of shrink ray. You've created something beautiful here. Congratulations.